Abandoned tents, a post-revel scourge at music festivals like Coachella and Glastonbury, could soon find new life as weather-resistant coats that convert into sleeping bags for the homeless; that is, if Dutch designer Bas Timmer has anything to do with it. 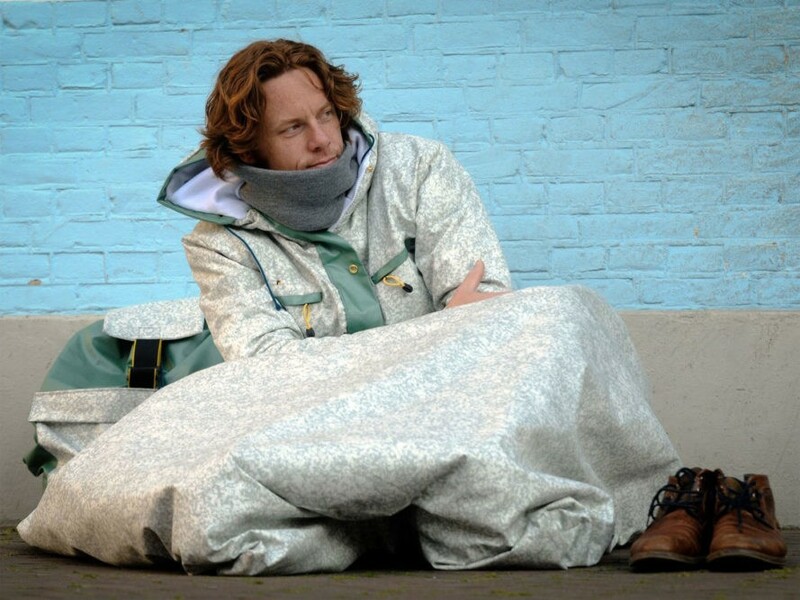 Timmer and his business partner, Alexander de Groot, were spurred to create the “Sheltersuit” after a friend’s father died from hypothermia due to exposure. Together with a team of volunteers, many of them Syrian refugees who receive assimilation courses, driving lessons, and help with accommodation in exchange for their efforts, Timmer and de Groot are working out of a studio in Enchede to produce and distribute as many suits as they can before winter descends. Timmer designed the Sheltersuit, which made an appearance at Dutch Design Week last month, for both portability and durability. The sleeping bag can be detached from the main jacket and stored in a waterproof tote, making it easy for the homeless to carry around during the day. At sundown, the sleeping bag can be reattached via zippers, allowing a more comfortable night’s rest. Timmer and de Groot are partnering with like-minded organizations and businesses to provide Sheltersuits at no cost to the people who need them. The pair says they hope to distribute 2,500 across the Netherlands and another 50 in Paris this month. Abandoned tents, a post-revel scourge at music festivals like Coachella and Glastonbury, could soon find new life as weather-resistant coats that convert into sleeping bags for the homeless; that is, if Dutch designer Bas Timmer has anything to do with it. Timmer and his business partner, Alexander de Groot, were spurred to create the "Sheltersuit" after a friend's father died from hypothermia due to exposure. Together with a team of volunteers, many of them Syrian refugees who receive assimilation courses, driving lessons, and help with accommodation in exchange for their efforts, Timmer and de Groot are working out of a studio in Enchede to produce and distribute as many suits as they can before winter descends.